System Restore is a Windows feature that can help fix certain types of crashes and other computer problems. Here’s how it works, how to set it up, and how to use it when things go awry. We’re going to be using Windows 10 in this article, but System Restore has been around a long time–and works pretty much the same way in each version of Windows. The instructions here are good for Windows 7, 8, and 10, and you’ll encounter only minor differences throughout the process. When something goes wrong on your system as a result of a bad piece of software–maybe an app you installed, or a driver that broke something important–it can be hard to fix. System Restore lets you restore your Windows installation back to its last working state. It does this by creating “restore points” every so often. Restore points are snapshots of your Windows system files, certain program files, registry settings, and hardware drivers. You can create a restore point at any time, though Windows automatically creates a restore point once per week. It also creates a restore point right before a major system event, like installing a new device driver, app, or running Windows update. Then, if something goes wrong, you can run System Restore and point it to a recent restore point. It will reinstate those system settings, files, and drivers, returning your underlying Windows system to that earlier state. This can be really useful when troubleshooting certain types of problems. For example, if you install a device driver that makes your computer unstable, you’ll want to uninstall that driver. However, in some cases, the driver may not uninstall properly, or it may damage system files when you uninstall it. If you use System Restore and select a restore point that was created before you installed the driver, this can restore your system files to the previous state before any problem occurred. Windows Restore can also be really useful for undoing the damage caused by a misbehaving app or Windows update. Sometimes, apps and updates can cause problems with other apps or even system components and simply uninstalling the app might not reverse the damage. Restoring to a point before the app was installed, however, can often clear up the problem. 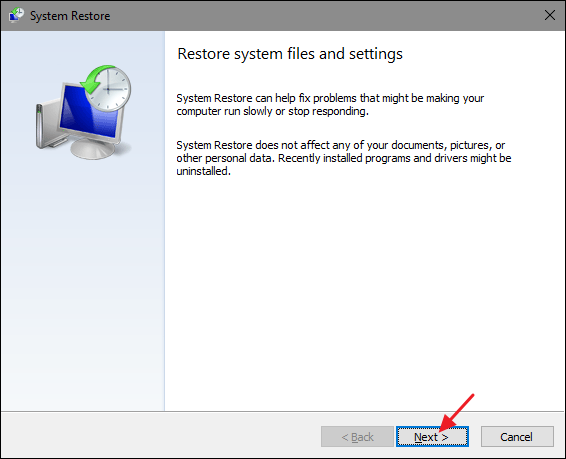 How Does Using System Restore Affect My Personal Files? How Does Using System Restore Affect My Apps? Windows does let you see exactly what programs will be affected when you go through the process, but it’s a good idea to restore to the most restore point possible to minimize problems with apps. It’s also a good idea to create manual restore points before you undertake big installations or settings changes so that you know you can revert to a very recent restore point if you need to. 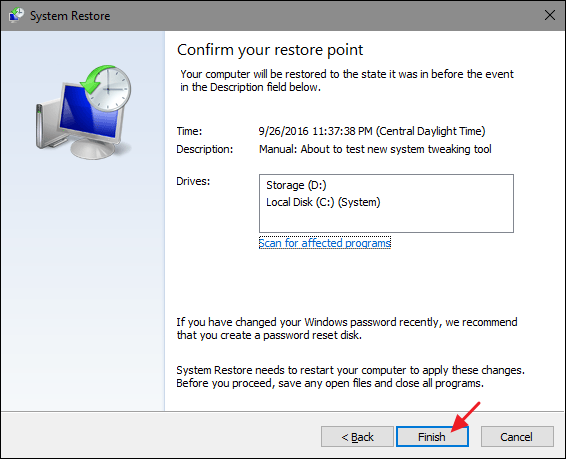 Can System Restore Remove Viruses or Other Malware? System Restore is not a good solution for removing viruses or other malware. Since malicious software is typically buried within all kinds of places on a system, you can’t rely on System Restore being able to root out all parts of the malware. Instead, you should rely on aquality virus scanner that you keep up to date. 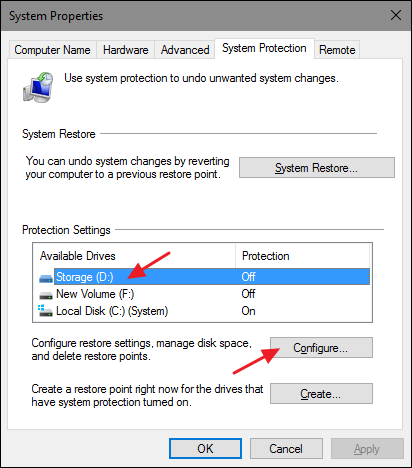 For many people, System Restore protection is turned on by default for your main system drive (C:) and not other drives on your PC. For others, System Restore is not enabled by default for any drives. Right now, there’s no consensus for why this happens. It does not appear related to whether Windows was installed fresh or upgraded, how much disk space you have available, what type of drives you have, or anything else we can figure out. If you want to be protected by System Restore, you should absolutely turn it on for at least your system drive. In most cases, that’s all you need, since all the things System Restore protects tend to be located on the system drive anyway. 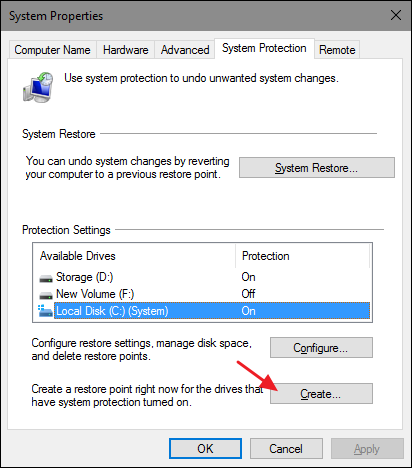 If you want to turn on System Restore protection for other drives–say, for example, you install some programs to a different drive–you can do that too. 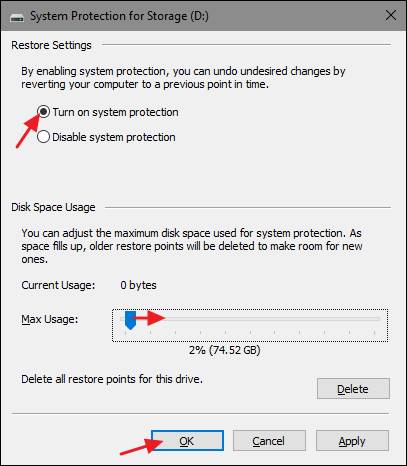 To make sure System Restore is turned on–and to enable it for specific drives–hit Start, type “restore,” and then click “Create a restore point.” Don’t worry. 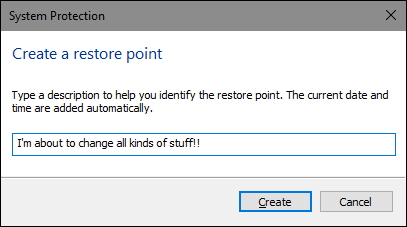 This doesn’t actually create a restore point; it just opens the dialog where you can get to all the System Restore options. On the “System Protection” tab, in the “Protection Settings” section, you’ll see the available drives on your PC and whether protection is enabled for each drive. To turn on protection, select a drive on the list and click the “Configure” button. You can then click “OK” again to exit the System Properties dialog. 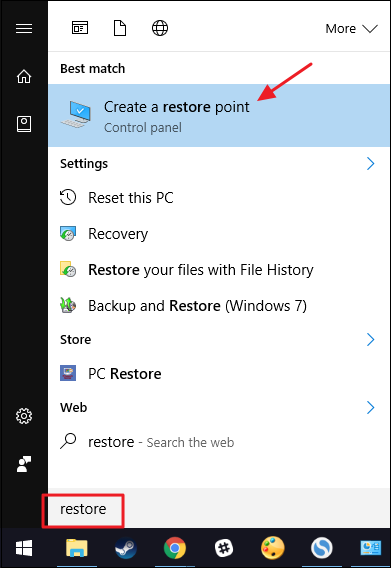 Just be aware that when Windows creates a restore point (or you create one manually), System Restore will create a restore point on all the drives that have system protection enabled. 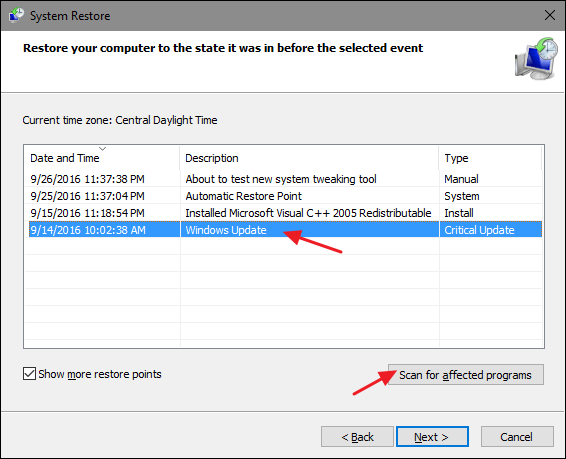 As we mentioned earlier, System Restore automatically creates restore points on a week, and whenever a major event like an application or driver installation happens. You can also create a restore point yourself whenever you want. 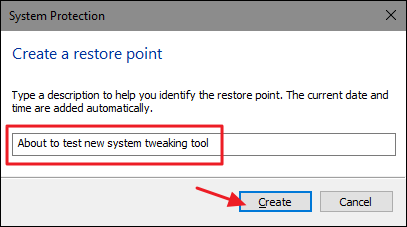 Hit Start, type “restore,” and then click “Create a restore point.” On the “System Protection” tab, click the “Create” button. Okay, so you have System Restore enabled, and you’ve been diligent about creating restore points whenever you mess with your system. Then, one fateful day, the inevitable happens–something goes wonky with your system, and you want to restore to an earlier restore point. You’ll start the restore process from the same “System Protection” tab where you configure System Restore options. 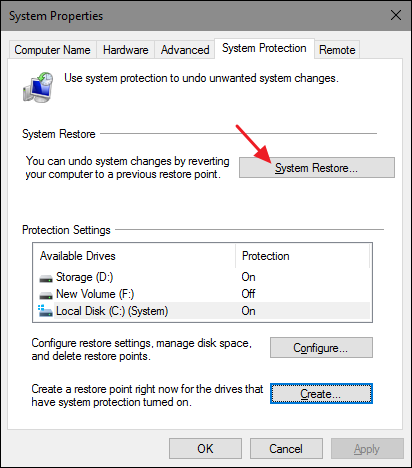 Hit Start, type “restore,” and then click “Create a restore point.” On the “System Protection” tab, click the “System Restore” button. The welcome page of the System Restore wizard just gives you a brief description of the process. Click “Next” to go on. The next page shows you the available restore points. By default, the only thing showing will probably be the automatic weekly restore point and any manual restore points you’ve created. Select the “Show more restore points” option to see any automatic restore points created before app or driver installations. 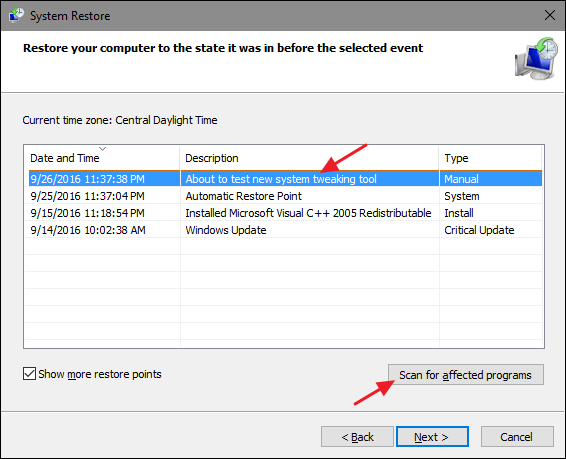 Select the restore point you want–remember, the most recent working restore point is ideal–and then click “Scan for affected programs” to have System Restore detect any programs that will be uninstalled during the process. System Restore will present you with two lists. 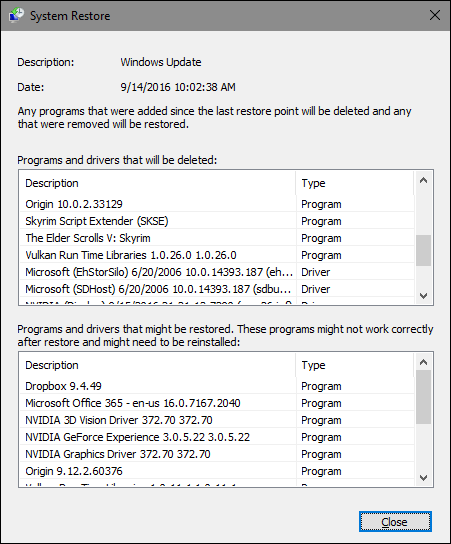 The top list shows you programs and drivers that will be deleted if you restore Windows to the selected restore point. The bottom list shows programs and drivers that might be restored by the process. Again, even programs and drivers that get restored might not function properly until you do a full reinstall. When you’re ready to restore, click the restore point you want to use and then click Next. Note that you can skip the scanning step and just click Next anyway, but it’s always good to see what apps will be affected before you start the process. System Restore informs you that once it starts, the restore process cannot be interrupted. Click “Yes” to start. Windows will restart your PC and begin the restore process. It can take a while for System Restore to reinstate all those files–plan for at least 15 minutes, possibly more–but when your PC comes back up, you’ll be running at your selected restore point. It’s now time to test whether it resolved whatever problems you were having. And remember that System Restore creates an additional restore point right before performing the restore process, so you can always undo your actions by performing this same process and selecting that new restore point. If System Restore doesn’t solve your problem, there are other ways you can go about addressing some of the issues System Restore is designed to solve. If the problem was caused by a recent update, you can look at uninstalling that Windows Update or reverting to a previous “build” of Windows 10. This should fix problems that might occur due to Windows Update and issues with your specific hardware and software. If you believe your system files are corrupted–or just want to check–you can try using the System File Checker to scan for and fix corrupt system files. If you installed an update or hardware driver and the problem started after that, you canuninstall the driver or update and block them from being automatically installed again. If Windows isn’t booting properly so you can’t do any of this, you can boot into Safe Mode. You can also visit the “advanced startup options” screen — these will automatically appear if Windows 10 can’t boot normally — and use the options there. Windows 10 also has two recovery tools that you can use if all else fails. The “Reset Your PC” feature can restore Windows to its factory default condition, or perform a clean installation of Windows while keeping your personal files intact. System Restore isn’t a cure-all, but it can fix a surprising number of problems and unfortunately has been downplayed somewhat in recent years amidst all of Windows’ other recovery tools. System Restore is almost always worth trying before you result to more drastic measures, though.